The GBPUSD has been in a 13 % price decline for 10 months. 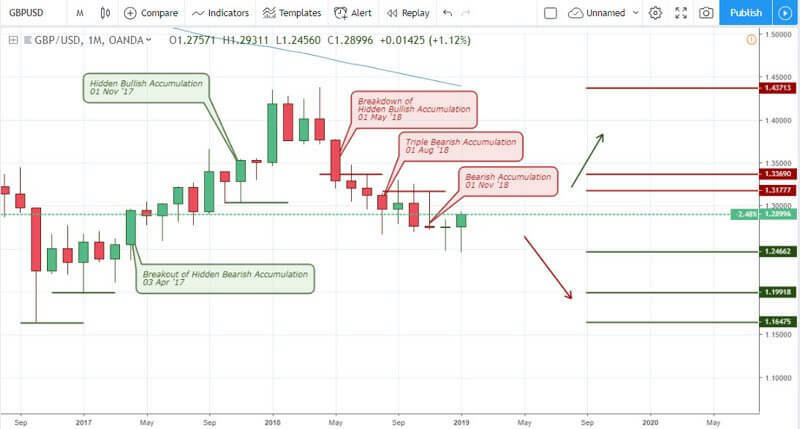 Market analysis on the weekly and daily charts, on the other hand, maintain bullish sentiments amid negative news from the U.S. Read on as we delve into these macro and technical indicators driving the price of the British pound. PM May’s Brexit plan will be put to Parliament approval, as they vote on whether it should stand or made invalid. In the event of Parliament rejection, we should expect exponential growth of a hard Brexit. President of the United States, Donald Trump demands to fund for the border wall, which has consequently resulted in a shutdown of government activities. This has become the longest experienced in modern times and although it has a direct impact on government establishments alone, there is an indirect impact on non-government businesses too. This event has resulted in a weakening of the U.S dollar against major currencies, including the British Pound. As shown on the above monthly chart, a breakout of hidden bullish accumulation on April 3 ’17 initialized a 10.5% bullish rise of the British pound. A breakdown of hidden bullish accumulation on May 1 ’18 triggered a short sell trade opportunity as the pair continued on a 6.0% price decline. More recent price pattern in the form of bearish accumulation triggered on November ’18 established a resistance level at 1.31777. At this point, the pair is generally in a bearish mode. From a weekly chart perspective, the bearish decline is set for a bull run as a double bullish accumulation pattern confirms the regular bullish divergence on December 31 ’18. This pattern establishes strong support at 1.24498. As shown on the daily chart illustration above, a bearish decent was triggered by a bearish engulfing pattern on November 8 ’18. The bullish pressure on November 14 quickly failed to a strong bearish closing candle on November 15 ’18. These patterns in combination with other bearish patterns culminated in a 4.4% strengthening of the USD. 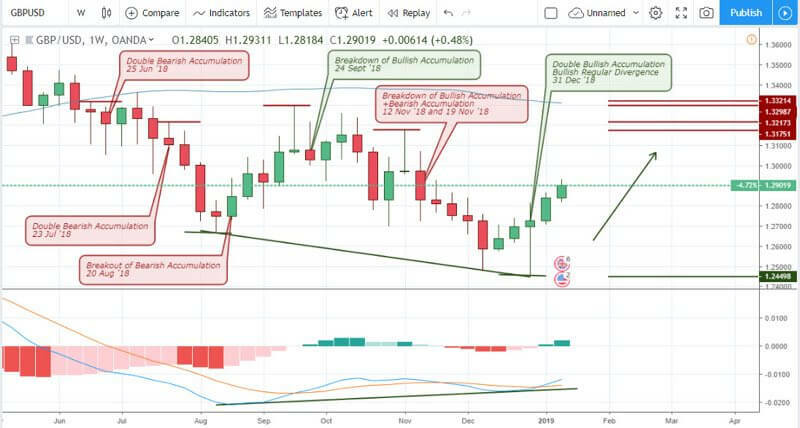 A triple bullish accumulation on December 27 was sufficient to guarantee a bullish trend that saw the GBPUSD attain a 1.16% increase, then later crashing to a failure of hidden bullish accumulation on Jan 02 ’19 06:00. 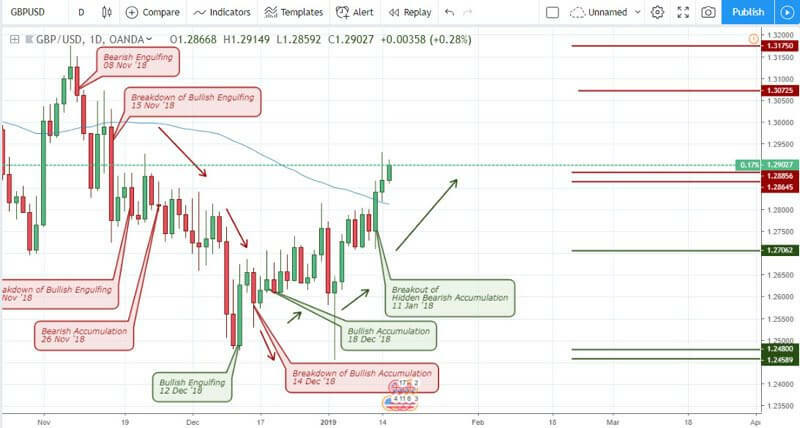 From our US binary options trading broker platform, a breakout of bearish accumulation on January 3 ’19 06:00 signaled a continuation of the bullish trend as we see a 2.76% uphill rush in the price of the GBPUSD. Subsequent breakout of bearish accumulation on January 08 ’19 22:00 and January 11 ’19 10:00 confirmed the weakness of sellers as the bulls take over the market. The breakout of bearish accumulation on January 8 ’19 22:00, similar to the 4-hour chart, confirmed the presence of weak sellers. Another pattern like this one was also triggered on January 11 ’19 10:00. These patterns left strong support levels behind at 1.27080, 1.27109, 1.28191, and 1.28593. Considering the current state of macro and technical events, we maintain a bullish outlook from a short to a medium time frame. However, according Nadex.com analysts the Brexit events from the UK may result in a highly volatile GBP and a probable continuation of the long term monthly bearish trend.